“I’m not sure what science the forces of no bring together up there [in Ts’msyen territory] except that it’s not really about the science,” opined Clark. Clark clearly impugns First Nations’ people, environmentalists, and pro-wild salmon advocates as “quitters” and fearful. The Declaration signers, guided by peer-reviewed science, conclusions unchanged since 1973 are criticized ex cathedra by Clark, a woman who studied study history and politics in university but did not graduate. No imprecation of Clark’s intelligence or knowledge is intended, yet one wonders whereupon she bases her scientific acumen to so flippantly dismiss scientists and First Nation peoples whose lifeways, guided by knowledge of the ecosystem gathered over millennia, are profoundly dedicated to stewardship of resources in their territories? On Friday, 12 February, four Russians visited Lax Kxeen to speak about a collapse in wild salmon numbers following completion of Gazprom-Shell-Mitsui-Mitsubishi consortium’s LNG project on Sakhalin Island. Geomorphologist Viktor Afanasev told of a collapse of the coastline after the Sakhalin II project. He noted that marine life was covered by the detritus from dredging as far as 10 kilometers away. Dmitry Lisitsyn, director of Sakhalin Environment Watch, told of many negative environmental consequences from the construction of the LNG project including toxins released by the continually burning gas flare, present at all LNG plants, and the emission of light pollution known to discombobulate the migration of juvenile salmon. He compared the two LNG plant locations and finds the bottleneck in Flora Bank is “more dangerous” than the expanse of Aniva Bay, Sakhalin Island. Alexander Vedenev, head of the Ocean Noise Laboratory at the Russian Academy of Sciences in Moscow, warned that high noise levels from a LNG plant would cause juvenile salmon to leave Flora Bank with diminished survival at sea. Aleksandr Shubin, who has studied salmon for over 30 years, said there are three important considerations for salmon and a LNG terminal: 1) that the LNG plant not impede adult salmon returning to spawning grounds, 2) that the LNG plant not impede juvenile salmon on way to the sea, and 3) that the plant be sufficiently distant from the feeding area for the majority of juvenile salmon. The Aniva Bay LNG plant satisfied all three considerations. However, these considerations are the reverse for a LNG facility at Lax U’u’la. 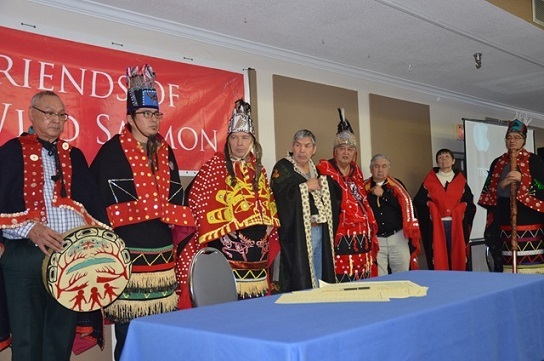 Shubin said it is the worst possible location and that if the LNG project were to be built there to expect a reduction in the Skeena River salmon population. The precautionary principle holds that when an undertaking has the potential to harm people or the environment then such an undertaking should be precluded. The precautionary principle is codified in several international treaties to which Canada is a signatory. Given the solid science that staunchly warns against and opposes the LNG project proposed for Lax U’u’la and its waters, the precautionary principle would resolutely reject any such undertaking. The Canadian Environmental Law Association notes that although referenced under domestic law implementation of the precautionary principle is sketchy. A rational approach would posit that prior to altering a major estuary rich in marine life, such as the Skeena River, it is only proper, prudent, and just to first consider all relevant data, science, and compare with similar projects elsewhere (for example, the Sakhalin Island LNG project) and apply this knowledge to preserve and safeguard the environment, salmon, and other marine life, as well as show respect for First Nations’ rights in their territories and, secondly, for the right of local people to enjoy the resources in their backyards. • First published in American Herald Tribune. This article was posted on Friday, February 19th, 2016 at 4:06pm and is filed under Corporate Globalization, Environment, Oceans/Seas, Russia, Salmon.